Volunteers harvest Vidal Blanc grapes in bitterly cold temperatures at Mazza Vineyards in North East on the morning of January 21. True ice wine can only be produced when the thermometer dips below 17 degrees Fahrenheit (-8.3 degrees Celsius), freezing the water in the berry and concentrating its sugars and other compounds. Drip, drop. Syrupy sweet nectar trickles into a metal trough as a cylindrical machine presses hundreds of pounds of frozen Vidal blanc grapes for all they're worth. The enclosure I'm standing in, at Mazza Vineyards in North East, has reached its teens, so now would be an appropriate time to talk about the hummingbirds and honeybees — they would be all over each other to get a taste of this stuff. It turns out those grapes are worth a lot. Extreme cold freezes the water in the berry but spares the sugars and other natural compounds, allowing the sweet essence of the grape to run free. Shriveled from exposure, each berry only has the tiniest bit of itself to give, yielding a fraction of the juice that the fall harvest would — as little as a meager 25 percent. Through Old Man Winter's alchemy, that juice has become liquid gold ready to be slowly fermented (a lot of sugar = a lot of work for the yeast). Ice wine is an extraordinarily valuable commodity, as few regions in the world supply the unique conditions under which it can be produced. First of all, the grape variety must be hearty enough to survive a "hard freeze" (defined as 17 degrees Fahrenheit or below by the Canadian standard, or 19 degrees by the German standard). Traditional or O.G. (original German) "Eiswein" uses Riesling grapes, but the Vidal blanc Mazza uses and Cabernet Franc are also good candidates — it takes some thick skin. 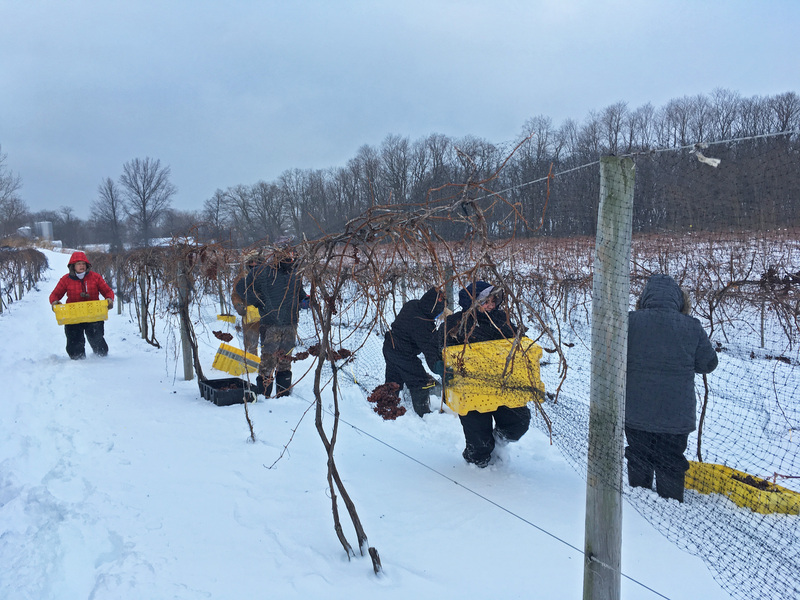 Secondly, the grapes must actually stay on the vine long enough for that hard freeze to arrive — meaning they cannot be rotted off by unseasonable heat and/or humidity, blown off by storms, or picked off by animals (Mazza utilizes precautionary netting). Lastly, when that hard freeze does arrive, a platoon of pickers must be ready at moment's notice to pick the plots by hand before the ideal temperature is exceeded. That often means harvests in the very early morning or even in the dark. For the purposes of this assignment, I was recruited to be a part of the Mazza Grape-Picking Militia, with a deployment time of 7 a.m. on Friday, January 11. I dutifully heeded my iPhone alarm's siren's call, swaddling myself in layer upon layer of insulation — only for the squad to be called off last minute. Too warm. My vehicle's cockpit temperature read a balmy 20 degrees. Warmth was not a problem on the second attempt, as the thermostat struggled to reach double digits on Monday, January 21. However, my timely response to the last-minute summons was, so I consequently missed out on all the gratifying hands-on labor (in the five degree sun!) Thankfully, Mario Mazza, general manager at Mazza Vineyards, did not hand me a demerit when I showed up well into the first pressing, conducted by the aforementioned Mearelli horizontal screw presses. Anyone who has experience with ice wine is used to waiting, and sometimes all for naught. "It's a risk and a gamble," says Mazza. 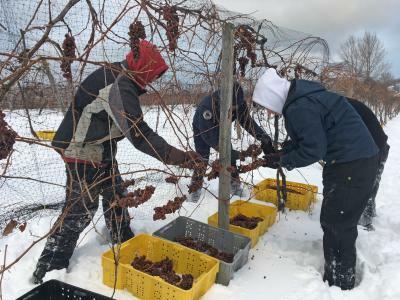 The Mazza family happens to have over three decades of it, having released their first ice wine vintage in 1984 — that's the same year Inniskillin, one of Ontario's stalwart examples, first hit the shelves. And thus the Lake Erie region became the first in the Western Hemisphere to enter this notoriously fickle arena. Today, it is one of Canada's most valuable exports by dollar value. A 350 mL bottle (half the size of a typical wine bottle) routinely costs in the $40 to $50 range, if not more. "It's not cheap," admits Mazza. But as has been made abundantly clear, it's not easy either, which makes it a special treat and meant to be enjoyed as such. Mazza's Ice Wine of Vidal Blanc contains "hints of fig, honey, marmalade, and apricot." Mazza recommends drinking it by itself as a dessert, but if one insists on pairing it, doing so with something strong enough to contrast all that sugar sweetness, such as a tangy and salty blue cheese. He is also adamant about the distinction between a true ice wine and the so-called "ice box" wines produced via cryoextraction, a process wherein the grapes are flash-frozen and then pressed. "They evolve more complex flavors left hanging on the vine versus freezing artificially at harvest time." He also stresses balance as a pillar of his winemaking philosophy, so he is conscientious of leaving some acidity and alcohol content in the glass to offset what might otherwise be cloyingly sweet. For all the time and effort involved, that's what's known as getting your just desserts. I heard (or "hoyd," if I'm John Fogerty) it through the grapevine that Mazza's Ice Wine of Vidal Blanc can be picked up at their winery on 11815 E. Lake Rd., North East, PA 16428 and PLCB Wines & Spirits stores via special order for $44.95 a bottle (375 mL). How grape juice saved North East, Pa.